Food Swapping seems to be the new big foodie craze at the moment with events popping up across the country. A month or so ago I read an article on the BBC News Magazine about its increasing popularity and was surprised to see that there was already a group on the go in Aberdeen. How did I not know about this? 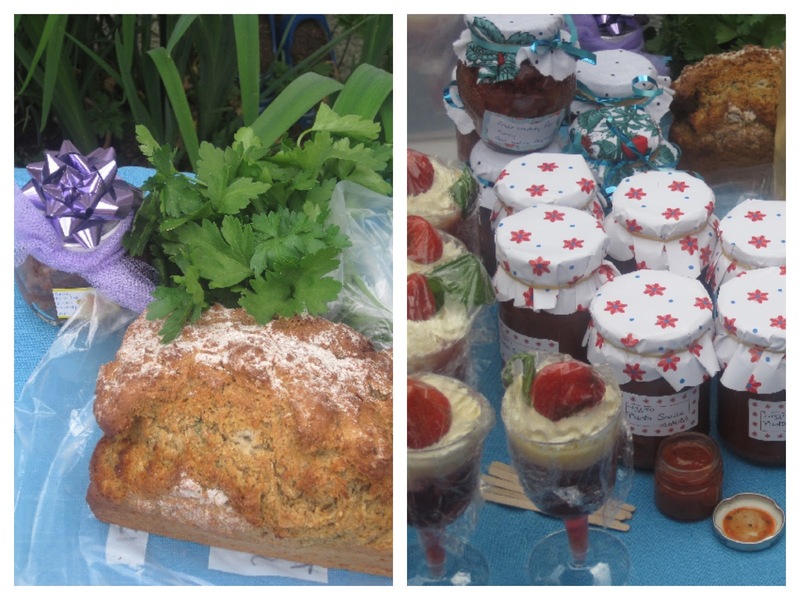 I wasted no time in tracking down the Aberdeen Gourmet Gals Food Swap on Facebook and signed up for my first event. 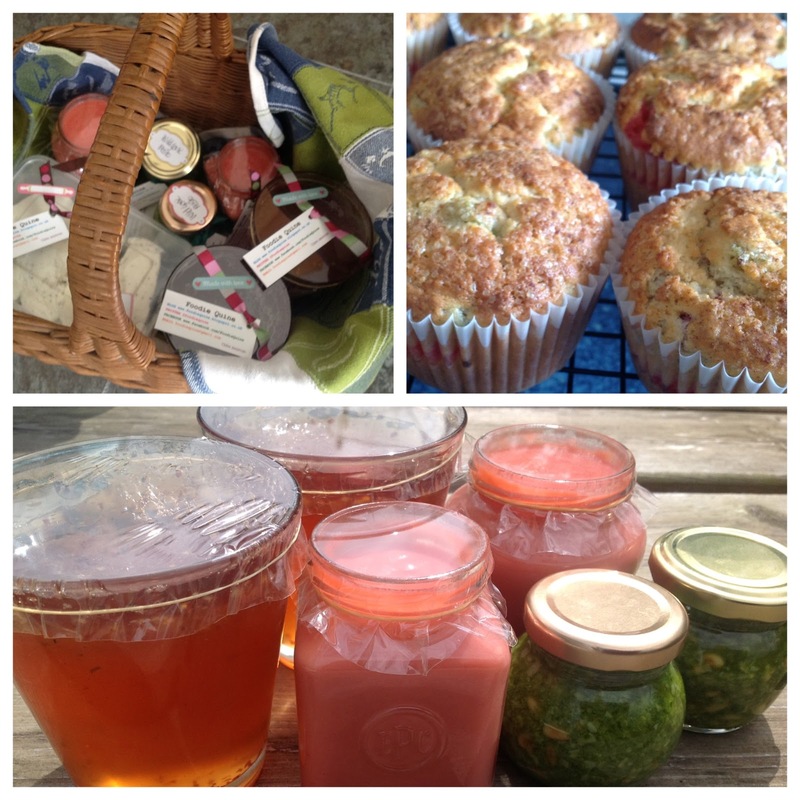 Set up in February 2013 by Netty Johnson there had already been two meets where like minded foodies got together for chat and swapping. So what to take to my first event? The idea is to share and swap home-made, home-grown or foraged food. It's the perfect solution for a glut of produce or when you've made more of something than your family could eat. Or you can bake or cook up something specially for the event. I oped for a bit of everything. Wild Garlic Pesto from my Foray into Foraging, Spiced Apple and Chilli Jelly leftover from Autumn preserving, Homemade Mozzarella and Rhubarb & Vanilla Curd. I felt like Little Red Riding Hood arriving with my basket of goodies. I also rustled up a batch of somewhat experimental Rhubarb Muffins with a Rhubarb Curd filling for the refreshment table. 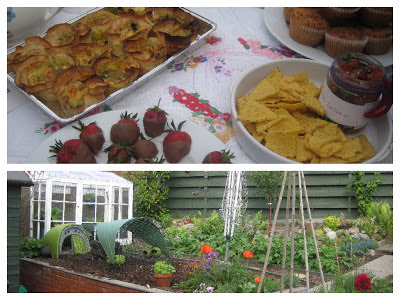 The food swap was held in the garden of our hostess Netty. What a fantastic oasis she has created right next to the dual carridgeway. The perfect city garden with veggies, fruit, an eglu and chooks. 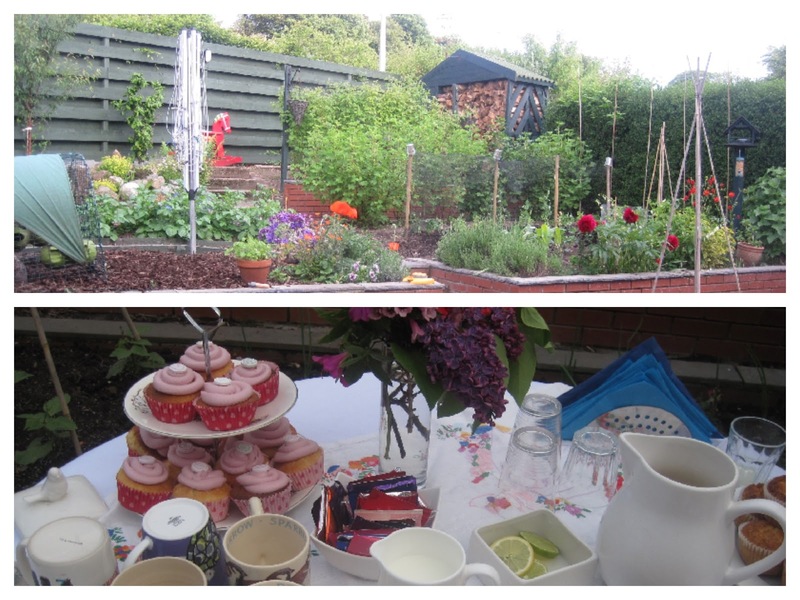 The al fresco refreshments included tea, coffee, homemade lemonade, chocolate coated strawberries, wild garlic pesto mini quiches, cupcakes, tortillas and fresh salsa. The swapping participants duly arrived with baskets and bags laden with foodie goodies. 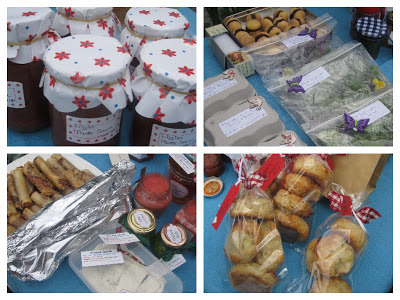 Lots of folk had made a real effort with their presentation and we soon had our own wee farmers market stall set up. Special guest for the night was Dan Holland from BBC Radio Scotland Kitchen Garden. 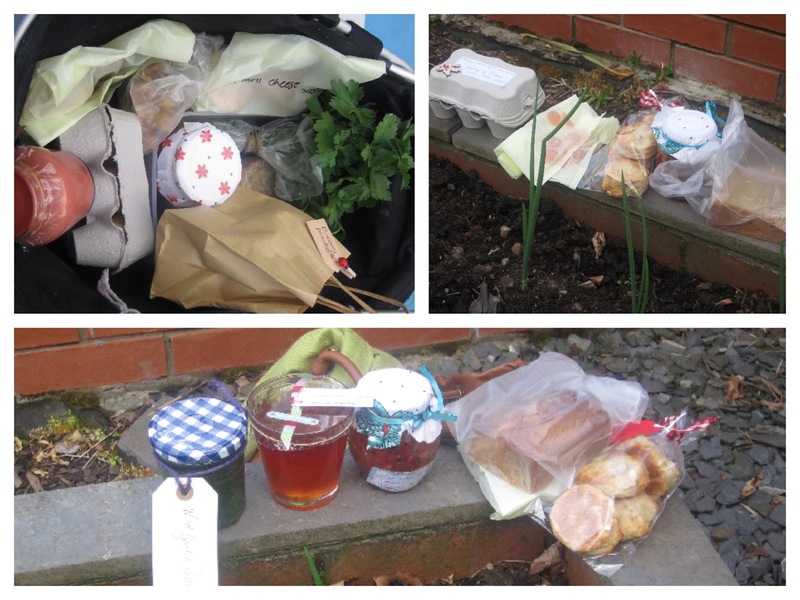 He had brought along three items from the Kitchen Garden team and had instructions to return with an item that Sue Lawrence could cook with on air. What a fantastic range of items were on offer. I doubt I've remembered them all but here's what I do recall... Fresh Eggs laid by Izzy and Rosie, Mixed Leaf and Edible Flower Salad, Cheese Scones, Apple & Cinamon Scones, Individual Trifles, Blueberry Pancakes, Wild Garlic Pesto, Fresh Salsa, Chocolate Custard Creams, Fruit Chutney for Curry, Thyme Soda Bread, Fresh Parsley and Corriander, Pasta Sauce and Spring Rolls. I'll know better for next time as Lizzie had brought along a mini jar of her Pasta Sauce so we could sample it. Clearly a seasoned swapper. Introductions, refreshments and chit chat over, the serious business of bartering began. All started off very calm and polite but got a wee bit heated when it turned out that a number of people had their eye on the Thyme Soda Bread that Dan had brought along. Not quite sure how he did it but somehow a four way swap was negotiated. A large knife was forthcoming from the kitchen and the loaf got quartered. I know exactly who got the best deal there. Noel Edmonds would not have allowed those kinds of dodgy dealings on Multicoloured Swap Shop. Thankfully my items all found new homes. I will admit to being a wee bit worried that they might all be sitting lonely on the table at the end of the night. A jar of my Wild Garlic Pesto headed off to the BBC Radio Scotland Kitchen Garden and I look forward to hearing what Sue Lawrence does with it. Tune in on Friday 14th June at 1.05pm or Sunday 16th at 12.05pm to find out. All too soon it was time to say goodbye to Rosie and Izzy and the Gourmet Gal Swappers. Friendships had been formed. Recipes discussed. 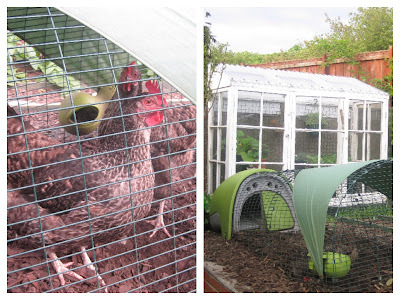 Chicken keeping tips exchanged and best places in Aberdeen for afternoon tea debated. There may even have been some undercover wine tasting. 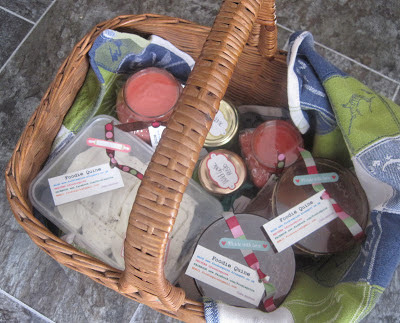 I came home with my basket filled with Pasta Sauce, Apple & Cinnamon Scones, Fresh Salsa, a doorstep of Thyme and Soda Bread, Mixed Leaf and Edible Flower Salad, a couple of trifles and some chocolate custard creams. The bread has already been devoured by me and Foodie Loon and girl has declared the chocolate custard creams the best biscuits ever. I look forward to enjoying the rest of my haul and hope that those who swapped with me enjoy theirs. I'm already looking forward to the next Food Swap evening. But even moreso to one 6 months down the line by which time Netty's husbands homemade wine will be ready to swap. Wow, what an amazing spread and a lovely idea! Must see if there's one near me. Love the idea of everyone circling the soda bread. Have a look on www.foodswapnetwork.com to see if there's one near you. If not you could always set one up. This sounds like a fantastic way to spend a day! What a selection of food and it sounds like the company was fabulous too! I shall be tuning in to hear what happened to your wild garlic pesto! I'm going to have to make some more so I can try this myself. What a fantastic idea, hopefully we'll see more of them appear throughout Scotland. Sounds as if people brought some fantastic food.....loved the fighting over Dan Hollands loaf. 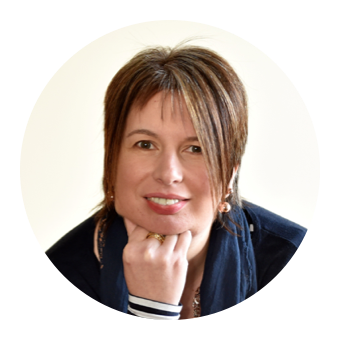 Really nice post Claire, enjoyed reading. Great idea...must persuade daughter to set up a similar event in Elgin ! There's lots of support available out there for anyone who wants to set one up.